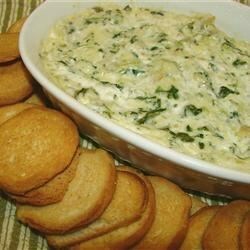 "This spinach dip is a huge hit at parties! It has become one of our favorite appetizers to serve guests when we entertain. Prepare ahead, but serve warm from the oven with fresh bread, crackers, chips, pita, etc." In a medium bowl, mix together artichoke hearts, spinach, mayonnaise, Parmesan cheese and 2 cups Monterey Jack cheese. Transfer mixture to the prepared baking dish, and sprinkle with remaining 1/2 cup of Monterey Jack cheese. Bake in the center of the preheated oven until the cheese is melted, about 15 minutes. I didn't like the mayo.